David McNally, ARL Public Affairs: Researchers from industry and universities across the nation have rallied around a collaborative technology alliance with the U.S. Army Research Laboratory since 2008. 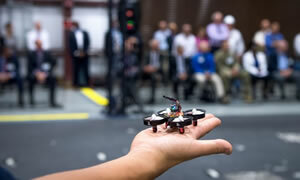 A research program called Micro Autonomous Systems and Technology, or MAST, came to its conclusion during a capstone event of presentations and demonstrations from Aug. 22 - 24 of both ground and air micro-robots. Teams of researchers gave 17 live demonstrations of the technologies they've been working on over the past several years. The University of Pennsylvania showcased a group of autonomous quadcopters that self-organize into formations. "I think there's still a long way to go to get them to do all of the behaviors we want in any type of environment," said Dr. Brett Piekarski, the Army's collaborative alliance manager. "There are certain areas where I think we've really pushed the bar and moved the state-of-the-art. One example is in scaling things down to be able to do autonomous behavior in something that fits in the size of your hand."